What a delight knowing that this gorgeous, handcrafted, four poster, canopy bed will be enjoyed by successive generations of your family. Built for the little princess in your family, the front of the headboard has a rectangular, padded panel, and the panel is upholstered with white, fine fabric with pink, patterned details. The headboard has a solid wood frame, with a triangular, top crest. The crest has a classic, top rim, and below the rim is a hand carved, circular design, with a beautiful, hand carved flower in its center. Elegant, hand carved, scroll details accent each side of the floral design. The headboard is framed with luxurious, tall, hand turned, post uprights. 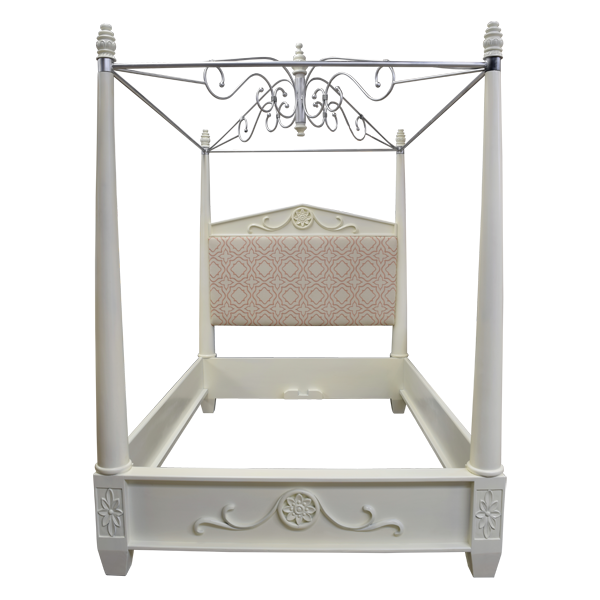 The bed has a solid wood, structural base, and the face of the base is adorned with a matching, hand carved, circular design, with a hand carved flower in its center. Hand carved, scroll details enhance both sides of the floral design. On each side of the base is a tall, hand turned, post upright, and the lower post is accented with hand carved, floral designs. 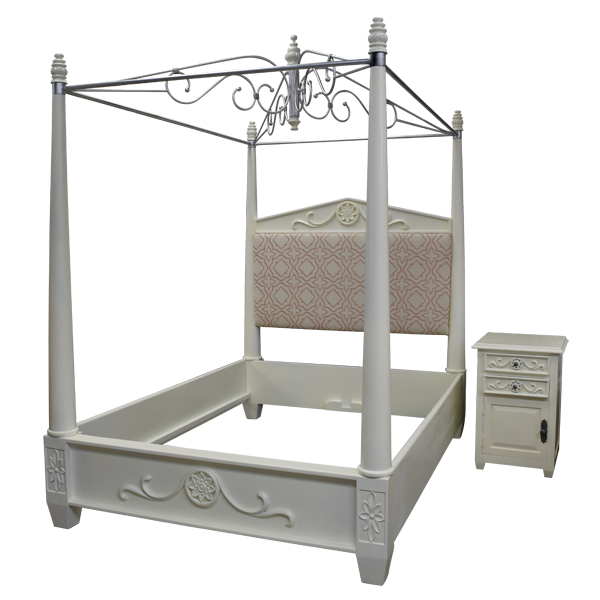 The bed has a strong, hand forged iron, canopy frame, and centered in the top frame is a decorative, hand forged iron, chandelier like design. It has an exquisite, white finish, and it is made with the best, sustainable, solid wood available. It is 100% customizable.